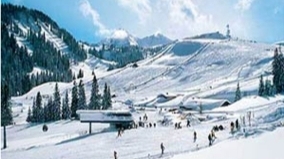 Lofer is a very popular winter holiday location for the Dutch, Germans, Italians and Austrians. However Austria is not a popular UK holiday location. This means that at present most of the UK flight operators offer incredibly cheap flights during the winter. Once you realise what is on offer in Lofer during the summer we think you may be tempted to give Switzerland a miss next year! Lofer boasts 58 kms of runs with its "jewel in the crown" being the beautiful non stop 10 kms run from top to village. The skiing is wonderfully uncrowded as few people outside Austria know of the resort. For the advanced skier there is the option of the Salzburg Skipass which covers 42 resorts, including Kitzbuhel, Zell am Zee and the glacier resort of Kaprun (which offers guranteed skiing all year round). Whilst these resorts are all approximately 35 minutes away many of the other resorts are even closer. The local ski bus network covers the resorts if you do not have your own transport. Every Monday night in Lofer (weather permitting) there is a torch lit toboggan run from the Loderbichi down the Alpine pasture lane. Meet at the telecabin - just follow the crowds. Every Tuesday and Thursday the 2.1 km toboggan run is lit from 20.00.pm onwards at the nearby Maria Kirchental. Enjoy the culinary pleasures of the Krenflseichessen restaurant and either toboggan or taxi back to the village. 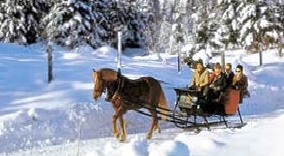 Indulge yourself and the family with a horse drawn sleigh ride from Lofer to St Martin where you can enjoy a little tipple to warm you before the return trip - unmissable! Enjoy the beautiful experience of viewing the native red deer coming back from a hard days prancing in the forest for their evenings feed at the Knappenstadl restaurant. Pick up a sled at the foot of the mountain and take an evening walk high up to the restaurant. Whilst they eat outside you can view them from the comfort of the restaurant. After you have seen and eaten enough simply toboggans back to the village along the illuminated nature trail. For the non down hillers amongst you why not try the 37 kms of cross country skiing trails in Lofer and St Martin. It is a wonderful way of enjoying the village scenery without disappearing up to your neck in snow. For the enthusiast the valley offers a total of 80 kms of trails in the mountains and village pastures. In Lofer and nearby St Martin, Toads and Weissbach you will find well lit skating areas for a gentle glide under the stars. 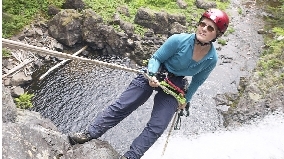 If you have not tried your hand at this sport it is certainly worth having a go. There is nothing better than to glide your stone to "home" and knock your opponent into touch - bliss! The village curling "sheet" can be found near the tennis courts just a 5 minute walk from the house. The local indoor swimming pools of Unken and Toads offer a change in scenery if the skiing gets too much for you. For those without their own transport the local bus service will get you there. Nearby Saltzburg or the beautiful lake side town of Zell am Zee are well worth a visit to stock up on souvenirs or just indulge yourself and offer a tranquil change if you need to rest your aching bones.